MJR! Holcomb Creek Workday - MJR! By Ryan – Eleven hardworking AAT members met at the Fawnskin Fire Station at 9:00am to continue the dedicated effort to repair the Holcomb Creek trail. We started off the day with our usual driver safety meeting and sign in session. Our plan for this AAT day was to work on repairing the first rock garden closest to mogul hill near the east entrance (unsure of proper name for this rock garden). 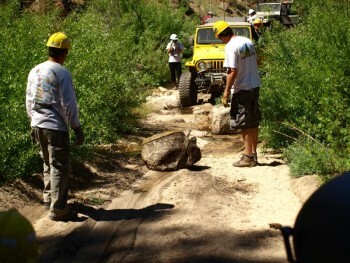 Once at the rock garden area, Chuck took the lead coordinating the placement of rocks into the proper configuration to make this part of the trail a “most difficult” section. To accomplish this, the work party split into two groups. 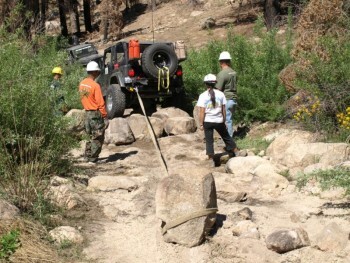 Jim, Missy, Ryan, and Cathy pulled “extremely” large (requiring multiple winches) rocks on to the trail. 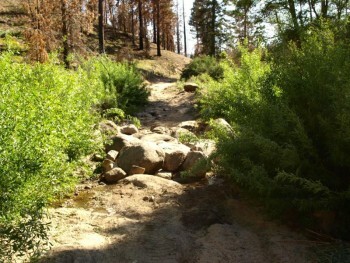 -Monitor illegal use of trail and check on west end fence. Thanks for all the teamwork, lets do it again next month!